Norway's Men's Curling Team - yet another victim of lost airline luggage. Reason: An airline once lost my luggage. I walked around for a day looking sorta like that - but not at an International sporting event. Next time I see someone out in public in their pajama bottoms, I'm going to ask them if they're a member of the Norwegian curling team. This is the BEST pajama party ever!! Torger Nergaard and Haavard Vad Petersson: (addressing teammate Haavard Vad Petersson) Very funny. You did pack the Super Glue solvent, didn't you?! "We're losing again!" he pants. "I can't play worth a darn," he rants. I'll distract you with my awesome pants." An insult is yelled from an opposing team: "What's wrong Pajama Boys? Too tired to remember how to play? You were obviously too tired to remember to put on some real clothes!" 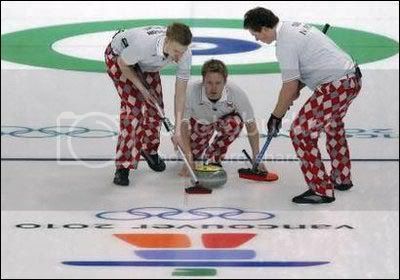 Norway's curling team is proudly sponsored by the Ludviquitengen Clown College. Why the village people never worked on ice. Having lost their luggage, the Norwegians had to borrow uniforms from the Czech Republic.